When looking at ways to improve the environmental impact of pig production, renewable energy generation is a popular topic. One such technology, gasification, is a series of chemical reactions (see image at bottom) that involve heating a suitable organic material in a controlled, low-oxygen environment to the point that the hydrocarbons (simple organic compounds that contain only hydrogen and carbon) are converted to synthesis gas (‘syngas’). Syngas is composed of hydrogen and carbon monoxide with smaller amounts of methane and carbon dioxide, all of which can be collected and utilized for heat and energy generation. This manure treatment technology also produces mineral-rich bio-char and ash. Since this bio-char is less bulky than raw manure (and contains most, if not all, of the nutrients) it is much easier to handle and more cost effective to transport long distances. This can be beneficial in areas where nutrients are becoming concentrated on crop fields and contributing to water quality problems. 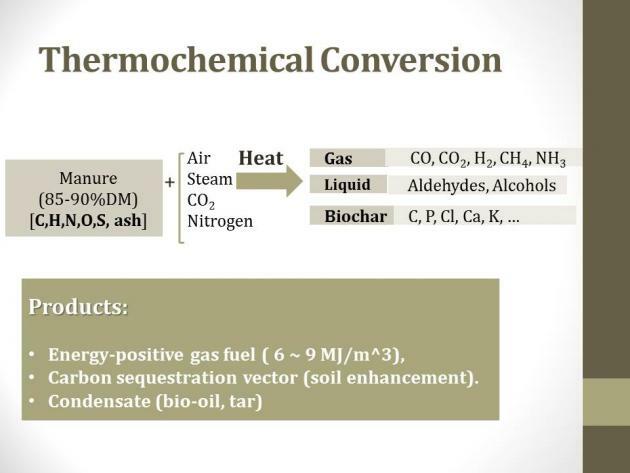 The use of bio-char as a topically applied soil amendment is currently being explored for its potential at reducing ionization and thus aiding in the retention of nutrients by impeding chemical transformations and volatilization. Many different organic materials can be used in gasification; wood, plant residues, certain types of manufacturing or household waste, and manure, among other biomass sources. Standard gasification systems utilizes materials that are dry (not pump-able) like beef feedlot manure, poultry litter, or manure that has undergone solids separation. 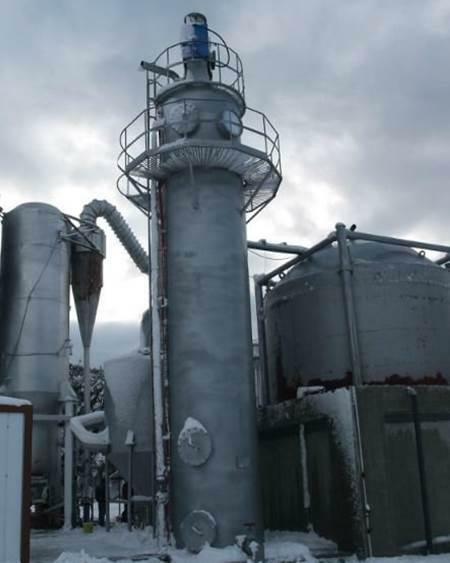 Pig or dairy cattle manure tends to be a wet material and either require drying or a system designed to handle materials like these – wet gasification systems. Related: Different types of manure gasification systems. Next PostNext What are the different types of gasification systems for generating energy from manure?